Breast cancer is the most common type of cancer and one of the main causes of death in women in Europe and United States, but even in many developing countries. Optical diagnostic methods are intrinsically non-invasive and could effectively be applied for medical screening. They can provide functional information of high potential relevance for diagnostic purposes. Moreover, the instrumentation is generally quite simple and inexpensive, as compared to what routinely used for conventional medical diagnosis. Optical mammography aims at the detection of breast lesions and at the discrimination between malignant and benign ones, based on differences in optical properties (absorption and scattering) between pathologic lesions and healthy tissue. Specifically, the absorption properties can provide information on tissue composition and on related functional parameters (like blood oxygenation), while the scattering properties depend on the microscopic structure of tissue, and can provide information on its density. At IFN, time-resolved transmittance spectroscopy is used to estimate the optical properties of turbid media, such as biological tissues, and breast tissue in particular. A short light pulse (~100 ps) is injected into tissue. The transmitted pulse is detected and, based on the diffusion theory, it is possible to estimate both the absorption and reduced scattering coefficients averaged over the light path. The technique is effective to build maps of the spatial distribution of the scattering properties, while absorption maps are not useful in practice, due to the low spatial resolution and contrast. To overcome this limitation, time-gated intensity images are used. They are obtained collecting only late arriving photons that have propagated for a long time in the medium and thus bring information on its absorption properties. Operating at different wavelengths, on (or close to) the absorption peaks of distinct chromophores, it is possible to derive information on tissue composition. Similar to conventional x-ray mammography, images are acquired in compressed breast geometry, and 2D projection images of the optical properties are built. A first version of the optical mammograph designed and built as a collaboration between the IFN-Milano and the Department of Physics of Politecnico di Milano operated at 4 wavelengths between 685 and 975 nm. It was applied in a clinical trial involving 200 patients with malignant and benign breast lesions within the frame of the EU project “Optimamm - Optical Mammography: Imaging and characterisation of breast lesions by pulsed near-infrared laser light”. It allowed us to identify typical optical features of healthy breast tissue as well as of malignant and benign pathologies. As an example, the mammary gland can be identified based on the strong absorption at 975 nm, due to the high water and collagen content, blood vessels and areas of strong vascularization are characterized by marked absorption in the red, and adipose tissue by intense absorption at 915 nm. The detection of malignant lesions generally relies on the strong absorption at red wavelengths, caused by neo-angiogenesis associated to tumor development. Some times cysts have absorption properties similar to the ones of neoplastic lesions, but they can be easily identified because of their liquid nature leading to low light scattering. Fig. 1 - Example of optical images of the breast, acquired in cranio-caudal projection. For comparison, the corresponding x-ray mammograms are also displayed on the left. Two cysts (green arrows) are detected in the right breast based on the low scattering at any wavelengths. A cancer (red arrow) in the left breast is identified through the strong absorption at 685 nm, that suggest a high content of deoxyhemoglobin. The strong absorption at 915 nm allows one to easily recognize the presence of adipose tissue close to the chest wall, in agreement with the transparent area in the x-ray mammogram. The optical mammograph was recently upgraded to operate at 7 wavelengths between 637 and 1060 nm. This allows us to estimate tissue composition in terms of lipid, water and collagen content as well as blood parameters (oxy- and deoxyhemoglobin, that is blood volume and oxygenation level). Collagen is investigated for its potential involvement in cancer development and correlation with breast density. Its quantification in tissues could actually be diagnostically relevant and allow the non-invasive assessment of breast density. Breast density is a well-known major risk factor for developing cancer. At present, its estimate relies on x-ray mammography. A non-invasive assessment of breast density (non involving the use of ionizing radiation) could be applied extensively, also to young women, and allow the identification of a risk group that would follow a personalized screening/diagnostic path. Fig. 2 - Optically derived parameters vs BI-RADS categories: water (a), lipid (b), collagen (c), blood volume tHb (d), blood oxygenation SO2 (e),scattering amplitude a (f), scattering power b (g), and OI (h). This activity is performed as a collaboration between the IFN-Mlano and the Department of Physics - Politecnico di Milano. 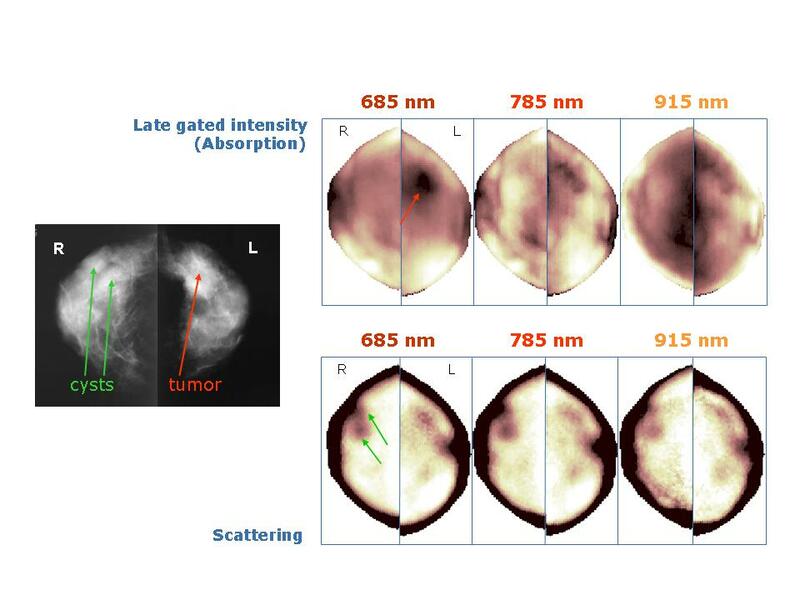 P.Taroni, A.Pifferi, E.Salvagnini, L.Spinelli, A.Torricelli and R.Cubeddu, “Seven-wavelength time-resolved optical mammography extending beyond 1000 nm for breast collagen quantification”, Opt. Expr. 17:15932–15946, 2009. P.Taroni, A.Pifferi, G.Quarto, L.Spinelli, A.Torricelli, F.Abbate, A.Villa, N.Balestreri, S.Menna, E.Cassano, and R.Cubeddu, “Non-invasive assessment of breast cancer risk using time-resolved diffuse optical spectroscopy”, J. Biomed. Opt.15:060501, 2010.